Simple Materials and a Prickly Texture Raise the Question, “What is it”? This “pin” brooch, made in 1992 by jeweler Beppe Kessler, was part of a larger collection of “pin” brooches, each piece one of a kind. The series itself was derived from an installation by Kessler, also in 1992, which involved hanging large rounded, pin cushions on a wall. 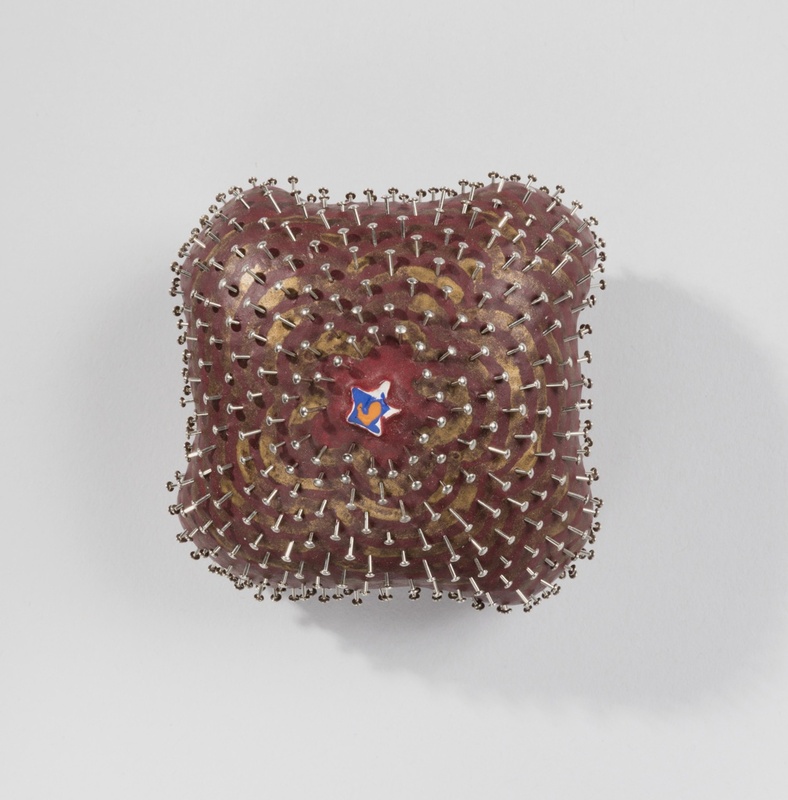 The brooches are an outgrowth of this project, reducing the size significantly, yet maintaining the texture and context created by the “pin cushion” effect. Kessler used a wide variety of techniques to construct this brooch made of wood, textile, foam, acrylic paint, straight pins and paper. Her work is very much about technique and construction methods: sawing, drilling burning, grinding, embroidering, painting, stringing, and in this case, pinning. It is her attention to detail that lends character to this brooch made of such mundane materials. To create a dialogue with the viewer, Kessler centered a small painted paper flower, elevated on a slight dome, in an area free from pins, which completely draws in the viewer’s eye, creating a dynamic relationship as the viewer seeks to get a closer look. Kessler, like several of the Dutch artists represented in the Susan Grant Lewin Collection, attended the Gerrit Rietveld Academy in Amsterdam, The Netherlands. While there, she focused on textiles, developing a reputation as a textile artist. After she graduated she taught herself jewelry making techniques. By 1981, she was making jewelry from throw away materials. For these projects Kessler used cheap, perishable materials like elastic, paper, sail cloth and PVC. By 2002, she shifted direction and began working with balsa wood, felt, alabaster, and pyrite. Kessler views her small works, like this brooch, as miniature sculpture, composed of both age-old and contemporary materials. The combination of materials and surface treatments in this pin is engaging, compelling the viewer to look at it repeatedly, maybe even touch it, or ask questions. What is it? What is it made of? When viewers asks such questions, they have fulfilled the maker’s goals. Kessler’s jewelry expresses her feelings and thoughts about life, and these are shared with the wearer and viewer as they are drawn into experiencing the jewelry from different perspectives. This brooch is one of more than 150 pieces of contemporary jewelry featured in Jewelry of Ideas: Gifts from the Susan Grant Lewin Collection, now on view.